The Tigers host No. 8 Louisville in a three-game series at Doug Kingsmore Stadium. • No. 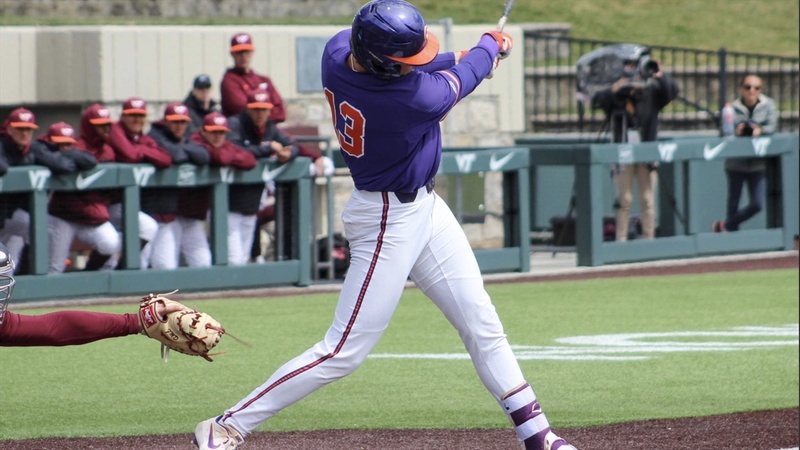 4 Georgia defeated Clemson 5-3 at Doug Kingsmore Stadium on Tuesday night. • The Tigers are averaging 7.1 runs per game and hitting .271 with a .380 on-base percentage and 53 steals. • The pitching staff has a 3.32 ERA, .260 opponents’ batting average and 2.91 strikeout-to-walk ratio and Clemson is fielding .965. • Louisville is led by 13th-year head coach Dan McDonnell. • The Cardinals have won six in a row after beating Kentucky 8-3. They are hitting .258 and have a 2.83 ERA and .977 fielding percentage. • Lucas Dunn is hitting .340, Tyler Fitzgerald is batting .293 with three homers and 25 RBIs and Michael McAvene has a team-high three saves. • The Tigers have answered each of their last 13 losses dating to 2018 with a win in their next game. • Clemson is 19-0 when scoring at least five runs and 3-7 when scoring less than five runs. • Clemson (2.92 ERA) and Louisville (3.17 ERA) are first and second in the ACC in ERA in conference games. Third place is NC State (3.75 ERA). • Freshman infielder Bryar Hawkins has emerged as an everyday player at first base and designated hitter. • He is hitting .321 with four doubles, two homers, 14 RBIs, 19 runs and a .418 on-base percentage in 23 games (20 starts). • He is hitting .375 with a homer, four doubles, seven RBIs, 15 runs and a .455 on-base percentage in 12 ACC regular-season games. • He hit a three-run homer in his first career plate appearance against Virginia Military in the second game of a doubleheader on Feb. 23. • He had five straight two-hit games from March 24-31.